Antique Russian Faberge silver 88 guilloche enamel goblet by Johan Viktor Aarne. An antique Russian Faberge gilded silver 88 and guilloche enamel goblet, workmaster Johan Viktor Aarne, St. Petersburg, circa 1895. 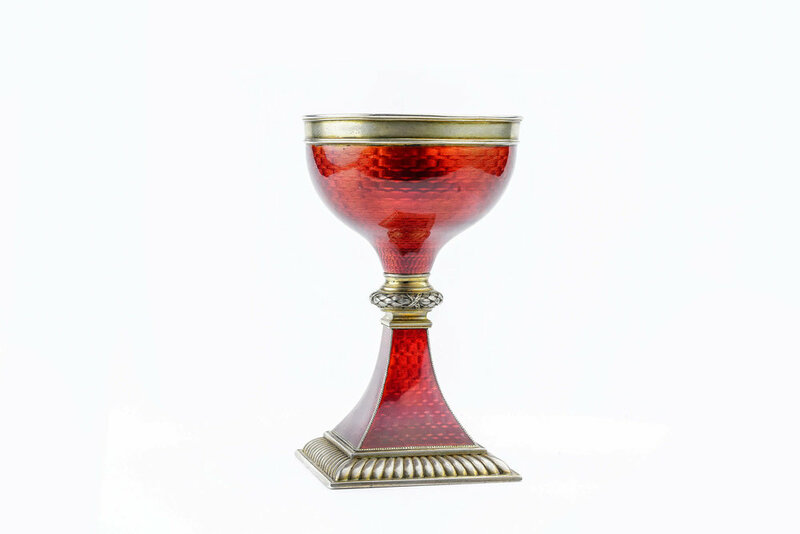 The goblet is on a spreading gadrooned square foot, enameled in translucent strawberry over a basket-weave guilloche ground, the waist with a ribbon-tied reeded knop, struck with workmaster’s initials, Faberge in Cyrillic, and 88 standard. Height is 4 inches, or 10.2cm.